Last Tuesday, December 16, 2014, the New England Patriots Charitable Foundation, in collaboration with New England Dairy & Food Council (NEDFC), representing more than 150 dairy farm families in Massachusetts, awarded the Edward Everett Elementary School in Dorchester with a $20,000 ‘Hometown Grant’ to support nutrition and physical activity programs within the school. 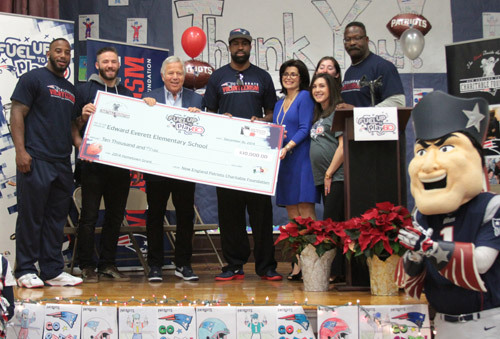 The school celebrated the grant with an event featuring New England Patriots players including wide receiver Julian Edelman, Patriots Chairman and CEO Robert Kraft and Massachusetts Dairy Farmer Marlow Duffy. “We are honored to be presented with this grant and the opportunity to further strengthen our school’s wellness and physical activity programming for our 287 students,” said Laura Miceli, principal, Edward Everett Elementary School, Dorchester, MA. During the event, the students heard from New England Patriots players, including wide receiver Julian Edelman, about the importance to being active for at least 60 minutes every day and fueling up with nutritious foods such as fruits and vegetables, whole grains, and low-fat and fat-free dairy. 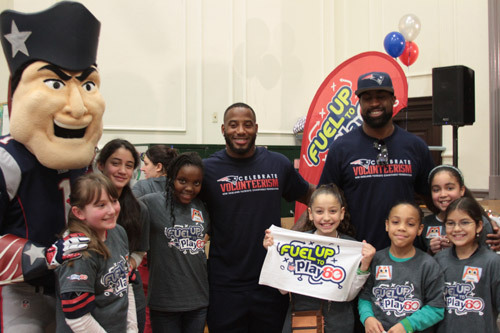 Created in partnership by the National Football League and National Dairy Council, in collaboration with the U.S. Department of Agriculture, Fuel Up to Play 60 is the nation’s largest in-school wellness program creating real transformational change in nearly 74,000 schools nationwide, including more than 1,600 schools in Massachusetts. 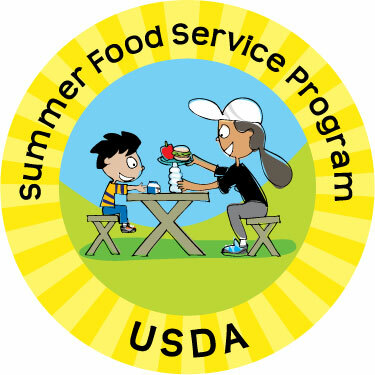 The program encourages youth to consume nutrient-rich foods and achieve at least 60 minutes of physical activity every day. The ultimate goal is to ensure changes made at school are sustainable, and to provide children with more opportunities to be physically active and choose tasty, nutrient-rich foods at school. To learn more, visit http://www.FuelUpToPlay60.com. 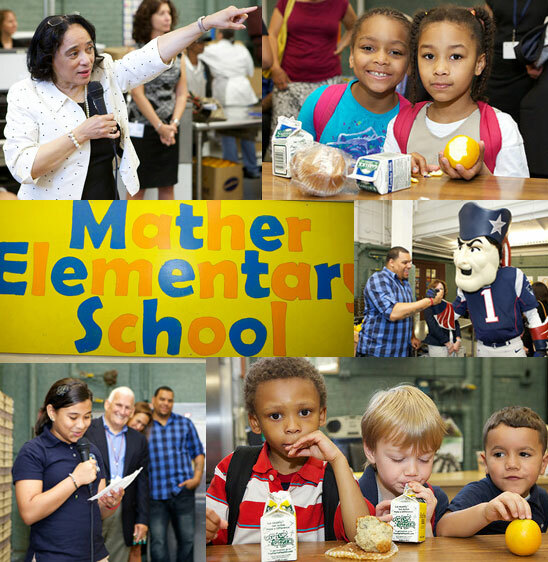 May 30, 2013 – Superintendent Dr. Carol R. Johnson and students from the Mather Elementary School came together with Newman’s Own Foundation, the Food Research and Action Center (FRAC), Project Bread, New England Dairy and Food Council (NEDFC), state officials, and Boston native and former NFL player Jermaine Wiggins to celebrate Boston’s success of Breakfast in the Classroom. With support from Newman’s Own Foundation, Boston Public Schools has implemented Breakfast in the Classroom in eight elementary schools this year. As a result, an additional 600 children receive breakfast each day in our schools, a 49 percent increase in participation. Research shows a range of benefits from offering Breakfast in the Classroom. In addition to fighting hunger, they include improved academic performance, less disruptive student behavior, fewer visits to the school nurse, and increased attendance. 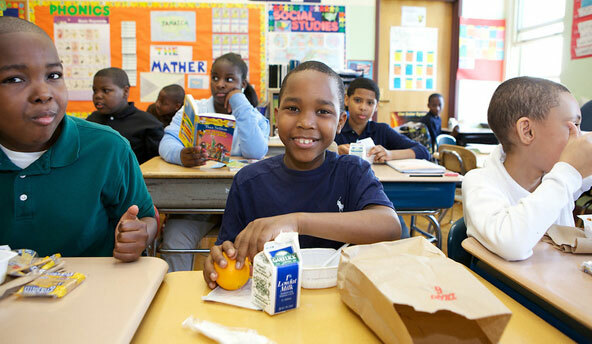 To guarantee that all children have a healthy start to their day, Boston Public Schools has made it a priority to improve participation in school breakfast, including the implementation of Universal Free Breakfast for all Boston Public Schools students by Michael R. Peck, Director of BPS Food and Nutrition Services. Boston Public Schools plans to continue expanding the program to additional schools in the fall of 2013.